How even is your bite? When you close your mouth, you should feel your top and bottom teeth fitting together perfectly with even pressure across each row. If your teeth don’t quite align, you might have an uneven bite. Our Kalamazoo dentist, Dr. Katherine Schier, can modify your bite with an occlusal adjustment so that your teeth line up perfectly. Continue reading to learn more! Why Do I Have an Uneven Bite? Patients can have an uneven bite for any number of reasons. Broken teeth, shifting teeth, teeth grinding, teeth crowding, tooth loss, or missing teeth can all result in changes to your bite, causing it to become more uneven over time. Even patients that had braces as children can find their bite becoming uneven as they age due to any number of these factors. If a bite is severely misaligned, Dr. Schier might recommend orthodontics. For an easier fix, though, you might be a candidate for an occlusal adjustment. 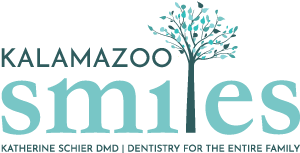 An occlusal adjustment is a procedure in which our Kalamazoo dentist will use an ultra-fine dental drill to shave away uneven areas of your teeth, resulting in a more even bite. At your appointment, Dr. Schier will first use the latest dental technology to identify exactly which area of your mouth needs an occlusal adjustment. She will then use a dental drill to shave away the parts of your teeth that are causing the misalignment. This is a quick dental procedure with minimal discomfort, so you should be able to drive yourself home after your appointment. Dr. Schier is dedicated to making sure you have the perfect smile. A misaligned bite can cause a number of serious oral issues down the line, such as worsening teeth grinding, enamel erosion, nerve damage, and damage to any existing dental work. If you think you have a misaligned bite, don’t wait. Contact our Kalamazoo, MI restorative dentist at Kalamazoo Smiles to ask about an occlusal adjustment today! Give our office a call at (269) 353-3700 to make an appointment.